Government officials killed 10 California sea lions captured near Bonneville dam, released six and relocated four this spring, the first season the government was allowed to euthanize sea lions with a record of eating Columbia River salmon. Early indications are that the program reduced the numbers of California sea lions congregating below the dam's fish ladders, according to a U.S. Army Corps of Engineers status report. The sea lions have now left to return to their southern breeding grounds. 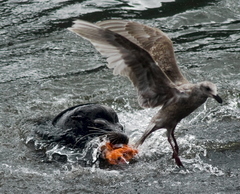 But the number of protected Steller sea lions visiting the dam increased, the report said. And the amount of fish consumed by sea lions at the dam, including an estimated 2,633 spring chinook, is still likely to be the second or third highest in the past eight years when final numbers are tallied. Two sea lions were relocated to San Diego's Shedd Aquarium and two others to the Gladys Porter Zoo in Brownsville, Texas. The 10 sea lions killed by injection all had a herpes virus and were unsuited for zoos or aquariums, the Corps' report said. Six sea lions captured in cages at Bonneville did not have a record of consuming fish from endangered or threatened runs on the Columbia. They were tagged with acoustic transmitters, branded and released.